2010: Lock Stock rock band is now online! 2010: Do movie actors exist in the worlds of the movies they star in? MATE + i3wm = Happy, happy, happy! I finally freed up a few minutes to try this solution for combined MATE desktop environment with i3 window manager. And I have to say it works perfectly! 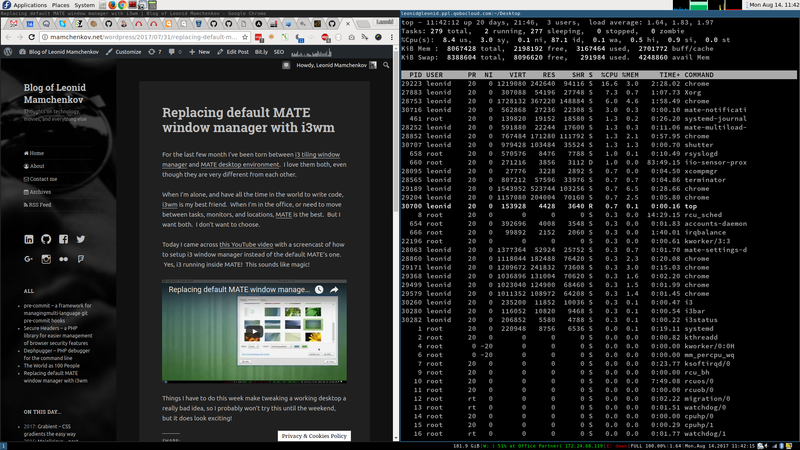 I now have the best of both worlds – MATE’s out of the way desktop, with good multi-monitor support, and i3wm’s tiling windows and keyboard navigation. Posted on August 14, 2017 Author Leonid MamchenkovCategories All, Linux, TechnologyTags Desktop, Fedora Linux, i3, MATELeave a comment on MATE + i3wm = Happy, happy, happy! For the last few month I’ve been torn between i3 tiling window manager and MATE desktop environment. I love them both, even though they are very different from each other. When I’m alone, and have all the time in the world to write code, i3wm is my best friend. When I’m in the office, or need to move between tasks, monitors, and locations, MATE is the best. But I want both. I don’t want to choose. Today I came across this YouTube video with a screencast of how to setup i3 window manager instead of the default MATE’s one. Yes, i3 running inside MATE! This sounds like magic! Things I have to do this week make tweaking a working desktop a really bad idea, so I probably won’t try this until the weekend, but it does look exciting! A week ago I blogged about i3 window manager and my attempt to use it instead of MATE. So, how am I am doing so far? The long story short: I love i3. It’s awesome. But I still switch back to MATE once in a while. What’s good about i3? It’s super fast. Even faster than a pretty fast MATE. It’s keyboard navigated, and it only takes about a day to get used to enough keyboard shortcuts to feel comfortable and productive. It’s super efficient. Until I tried i3 I didn’t recognize how much time I spend moving windows around. It is unexcusable amount of time spent needlessly. What’s bad about i3? It’s low level. In order to make it work right with multiple screens, one need to get really familiar with xrandr, the tool I last used years ago. If you are on a laptop, with a dynamic setup for the second screen (one monitor at the office, one at home, and an occasionally different project at client’s premises), you’ll need a bunch of helper scripts to assist you in quick change between these setups. And then there is an issue of flickering desktop. The web is full of questions about how to solve a variety of flickering issues when using i3. The one that I see most often is the screen going black once in a while. Sometimes it takes a second to come back, sometimes a few seconds, and sometimes and it doesn’t come back at all. The more windows I have, spread across more workspaces, with more connected monitors – the more often I see the issues. It’s annoying, and it’s difficult to troubleshoot or even report, as I haven’t found a pattern yet, or how to reproduce the problem. With that said though, I am now about 80% time using i3. I like the simplicity and efficiency of it. It’s so good, that I work better even without a second monitor. But when I do need a second monitor (paired programming, demos, etc), or when I have a projector connected, I switch to MATE. That’s about 20% of my time. In the last few days my attention was unfairly distributed between a whole lot of tasks. The fragmentation and constant context switching affected my productivity, so I briefly revisited my toolbox setup, in hopes to find something that I didn’t know about, forgot about, or have greatly underutilized. Persistent sessions, where you can work on a remote machine, detach your terminal, disconnect from the machine entirely, and then, at some point later, connect again and continue from where you left off. With simpler workloads and reliable Internet connection, this became less useful to me. When I do need this functionality, I use screen, which is more often installed on the machines that I work with. Terminal multiplexer, where you can split your terminal screen into a number of panels and work with each one like it’s a separate terminal. This is still useful, but can be done by a number of different tools these days. I use Terminator, which supports both horizontal and vertical screen split. Terminology is another option from a choice of many. I thought, let me find something that people who used tmux have moved on to. That search led me, among other things, to “ditching tmux” thread on HackerNews, where in the comments a few people were talking about i3 tiling window manager.